Get the bunnyhero puppy widget and many other great free widgets at Widgetbox! Another big part of our lives have been our hounds. 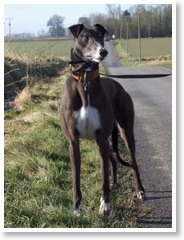 We adopted Geezer from Greyhoundhomer RGT in February 2008 and he joined our adventures on board Cassie last season. Unfortunately he died suddenly just after New Year 2009 and we missed having a dog so much we've now adopted Dudley. Retired greyhounds make wonderful pets. Many people mistakenly believe that because they've raced that they need huge amounts of exercise. They have actually been described by people in the know as 40mph couch potatoes, and they actually only need two 20-minute walks a day and then sleep for the rest of the time! Many newly-homed greyhounds don't have that much stamina, as they are built for short, sharp bursts of speed, rather than sustained long-term activity. However, they are very adaptable and will soon build up to much longer walks and, as in Dudley's case, still have enough energy to charge round the garden (and sometimes the house!) when he gets home! 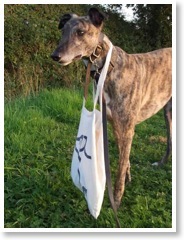 If you want to know more about adopting a retired greyhound go to the links page. As well as details of Greyhoundhomer RGT (which covers mainly Suffolk, Essex & Herts) and the Retired Greyhound Trust (branches nationwide), there is also a link to Greyhound Data where you can find pedigree and racing history details, if you know the names under which they raced. Geezer raced as 'Blonde Geezer' and Dudley as 'Cagey Dougie'. So, these pages are devoted to our canine companions, past and present, including (but not exclusively) their adventures on board Cassie. Just so you know who's who, Geezer is the remarkably handsome brindle fella and Dudley is the slightly battle-scarred but equally adorable black boy with cuddle-me eyes. Use the links on the sidebar to view the photo galleries.